The old green Mansfield canoe glides silently through the bay its bow pointing toward the narrow ribbon of moonlight reflecting on the water. Reeds brush gently by the gunwales as we maneuver our way down the murky channel and into the cattails. We can hear the raucous laughter of mallards from a pool deep in the swale grass behind the trees. We whisper to one another “That’s Right!” at the same time. Whistling wings whiz by our heads as we turn into the small slot in the puckerbrush. The sides of the canoe squeak uncomfortably loudly against the ragged edges of the woody branches, like nails on a chalkboard. I am hunting with my friend John Lesher in a new spot. The water level in the lake is so low this year that we had to forego the blinds we normally build in the larger backwaters. This year is going to be all about adaptation and honoring our canine partner of twelve years. We slide out of the canoe in our waders as quietly as we can, mud swallowing our feet in the decaying detritus of swamp gas and pungent wetland vegetation. We have to lean forward with each step to navigate the morass, our rear feet making a deep sucking sound when they are finally freed from the primordial ooze. I love this. I love everything about this sport. 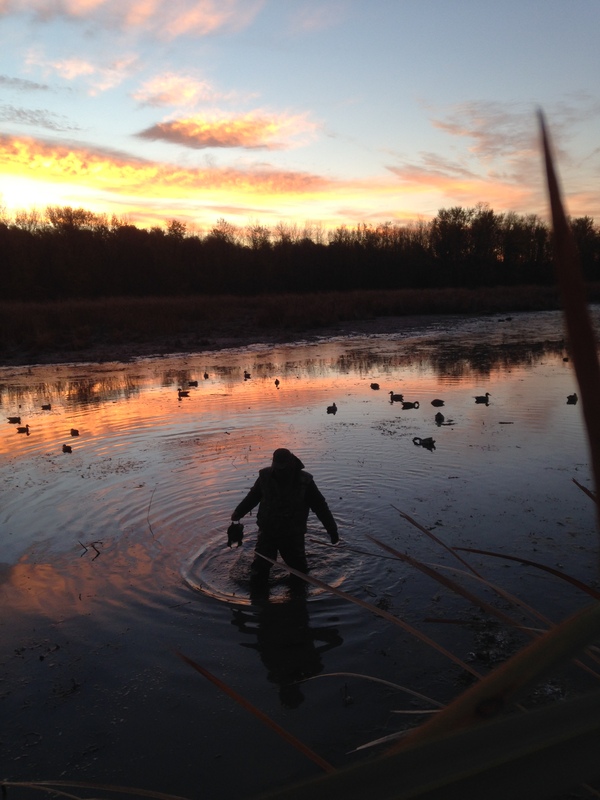 The mud, the smells, the sounds, even the challenge of setting decoys in a small pool of water surrounded by muck. We get the wood duck decoys situated to the side, greenwing teal to the rear and mallards to the front of a “J” hook pattern, the top of the letter facing into the wind, creating a landing zone in the crook of the bottom of the pattern. We retreat to the canoe, and comfort John’s 12 year old yellow lab, Remi. This will be his last season. He will not be asked to retrieve or suffer the indignities of getting stuck in the mud chasing a duck. This year John and I will retrieve the birds and offer them to him in a gracious manner of consent that he has been a great partner for 12 long years, retrieving hundreds of birds, and as he always has, guarding the ubiquitous donuts. Remi will be our Guest of Honor this season, allowing him a chance to bask in the glory of what he has most loved during his glorious dozen seasons with us. As the dark purple horizon begins to show shades of sage and burnt orange, the swamp awakens. We still can’t see the birds, but we hear them landing in the decoys and flying just over our heads along the tree line. 6:32am is legal shooting time on Opening Day and we stare at our watches, hearts racing in time with the sweep second hand. There are a half dozen birds in the spread, and although we can see the wake caused by their swimming bodies, we cannot distinguish the species. We wait impatiently. The cup of coffee is sitting on its side amidst the oak ribs of the hull, black liquid mixing with the mud in the bottom of the boat. The time has come. On the count of three we rise to our knees and raise our shotguns in unison. Nothing moves. The birds continue to swim in the decoys. Remi whines and trembles in anticipation. Although he cannot see the birds, he knows they’re there. Likely he can smell their oily undercoat. Suddenly a flock of teal strafe our spread, miniature fighter jets, their wings tearing the cool morning air. They race forward and circle back to land at the rear with the plastic deceivers. As they make their final approach, we both shoulder our guns and fire.